Thanks a lot to those authors who’ve sent with their original problems also the definitions of fairy terms (this is mostly about seldom fairy elements)! Also I’m grateful to Mike Prcic, the editor of StrateGems, who’s kindly sent me a big list of fairy pieces, conditions, stipulations he’s accumulated himself (I’ve started to insert those I didn’t have yet into this database) and to Georgy Evseev, who helps with some definitions and also with a correct translation into Russian. Bishop-Lion(BL) Moves like Lion, but on Bishop-lines only. Bishop-Locust(LB) Moves like Locust, but on Bishop-lines only. Bishophopper(BH) Moves along Bishop-lines over another unit of either color to the square immediately beyond that unit. A capture may be made on arrival, but the hurdle is not affected. Chameleon On completing a move, a Chameleon (from classical standard type) changes into another piece, in the sequence Q-S-B-R-Q… Promotion may be to a chameleon at any stage in the cycle. Grasshopper(G) Moves along Q-lines over another unit of either color to the square immediately beyond that unit. A capture may be made on arrival, but the hurdle is not affected. Kangaroo(KA) Moves along Queen-lines like a Grasshopper, but over 2 hurdles (which may or may not stand on adjacent squares) to the square immediately beyond the second hurdle. A capture may be made on arrival, but the hurdles are not affected. Kangaroo-Lion(KL) Moves along Q-lines over 2 hurdles of either color (which may or may not stand on adjacent squares) to any square beyond the 2nd unit. A capture may be made on arrival, but the hurdle is not affected. LEO(LE) (0,1)+(1,1) Chinese. Chinese Queen. Moves as Queen, but captures only by hopping over a hurdle to any square beyond. Lion(Li) (0,1)+(1,1) Lion. Moves along Queen lines over another unit of either color to any square beyond that unit. A capture may be made on arrival, but the hurdle is not affected. Locust(L) (0,1)+(1,1) Locust. Moves along Queen lines only by capturing an enemy unit, arriving on the square immediately beyond that unit, which must be vacant. MAO(MA) The Chinese knight, which is a Rider, moving along a bent line to the arrival square of a normal Knight, first orthogonally then diagonally. The Mao can be interfered with on the intervening square. Marine Knight(MS) Moves as Knight provided destination is vacant, captures an enemy on (1,2) by a leap to (2,4) – which again must be vacant. Marine pawn(MP) Moves as a pawn, but captures by hopping over its enemy diagonally forward. MP may be captured en passant by an enemy Pawn or Marine Pawn and may capture en passant an enemy Pawn or Marine Pawn. The Marine Pawn can promote to Siren, Triton, Nereid, Marine Knight or to any other fairy or orthodox piece that stands on the board. MOA(MO) The Chinese knight, which is a Rider, moving along a bent line to the arrival square of a normal Knight, first diagonally then orthogonally. The MOA can be interfered with on the intervening square. NAO(NA) (1,2) Chinese. Chinese piece operating along the lines of Nightrider. Nereid (ND) (1,1) Marine. Marine piece operating along Bishop lines: without capture moves as Bishop, with capture – as Locust. Nightrider(N) (1,2) Rider. Operates along straight lines with squares lying a Knight`s move away from each other. PAO(PA) (0,1) Chinese. Chinese piece operating along Rook lines: moves as Rook, but captures only by hopping over a hurdle to any square beyond. Poseidon(PO) The Marine King is named “Poseidon”. The Poseidon moves like a King when not capturing, and captures adjacent pieces like a Locust. Rook-Lion(RL) (0,1) Lion. Moves along Rook lines over another unit of either color to any square beyond that unit. A capture may be made on arrival, but the hurdle is not affected. Rook-Locust(LR) (0,1) Locust. Operates along Rook lines. Rookhopper(RH) (0,1) Hopper. Operates along Rook lines. Rose(RO) (1,2) Octagonal Rider (extents the move of the Knight on a circular path e.g. a4-b6-d7-f6-g4-f2-d1-b2 or a4-c5-e4-f2). Siren(SI) (0,1)+(1,1) Marine. Marine Queen. moves as a Queen but captures only as a Locust. Triton(TR) (0,1) Marine. Marine piece operating along Rook lines: without capture moves as Rook, with capture – as Locust. VAO(VA) (1,1) Chinese. Chinese piece operating along Bishop lines: moves as Bishop, but captures only by hopping over a hurdle to any square beyond. Andernach Chess A piece (excluding King) changes its color after any capturing move. Rooks on a1, h1, a8 and h8 can be used for castling, provided the usual other rules for that move are satisfied. Anti Take & Make Every capture (“take”) must be complemented by a further step (“make” which is not a capture) by the captured piece (Kings excluded), which must move from its square of vanish (according to the wishes of the capturing side in case of options). The capture is forbidden if the captured unit has no possible moves. Promotions at the end of the “make” element are normal. Anti-Andernach A piece (excluding King) changes its color after any non-capturing move. After capture, the piece retains its color. Rooks on a1, h1, a8 and h8 can be used for castling, provided the usual other rules for that move are satisfied. After castling, Rooks do not change color, If White makes a non-capturing move with neutral or halfneutral piece, that piece becomes black and vice versa. Anti-Circe Anti-Circe Calvet (the default type): After a capture the capturing piece (Ks included) must immediately be removed to its game array square (necessarily vacant, else the capture is illegal). Captures on the rebirth square are allowed. Game array squares are determined as in Circe. antiCirce Cheylan: As antiCirce Calvet except that captures on the rebirth square are not allowed. Anti-Circe (Cheylan) When a piece captures (including King), it must come back to its rebirth square. If this square is occupied, the capture is forbidden. A Pawn capturing on its promotion rank promotes before it is reborn. The captures on the rebirth square are forbidden. Chameleon Chess All pieces on the board which are displayed as orthodox Q, R, B, S, are Chameleons. A Pawn can promote only in Chameleon-pieces. Circe Captured units (not Ks) reappear on their game-array squares, of the same colour in the case of pieces, on the file of capture in the case of pawns, and on the promotion square of the file of capture in the case of fairy pieces. If the rebirth square is occupied the capture is normal. Couscous Circe As Circe, but the captured piece reappears on the Circe rebirth square of the capturing unit. Pawns reappearing on promotion squares are promoted instantly, at the choice of their own side. Disparate If one side makes a move with a piece of type “x” (black, white,neutral, half-neutral, etc., King included), the other side cannot answer immediately by moving a piece of the same type “x”.). A pawn promoting is a pawn move. Isardam Any move, including capture of the King, is Isardam illegal if a Madrasi-type paralysis would result from it. KoBul Kings When a piece (not a pawn) of his own side is captured, a King transforms into a Royal piece of the same type as the captured one. When the King is in the form of any Royal piece and there is a capture of one of the pawns of his own side, he becomes a normal King again. Captures are illegal if their result is self-check because of the transformation of the Кings according to KoBul rules. Castling is allowed only if the KoBul King is on his initial square in the form of a normal King and if he has not already moved; however he may already have been transformed. In the case of capture by a King in AntiCirce he is reborn on his initial square and may castle. If the capture is by a King which is in the form of some Royal piece, he is reborn on the initial square of that piece. KoKo A move is possible only if the piece moved arrives on a square next to another unit. Madrasi Units, other than Kings, are paralysed when they attack each other. Paralysed units cannot move, capture or give check, their only power being that of causing paralysis. Madrasi RI (rex inclusive): the rule applies to Kings as well, so the two Kings may stand next to each other. Maximummer Black must play the geometrically longest move or may choose from among longest moves of equal length, distances being measured from the center of each square. Diagonal and oblique distances are measured from the orthogonal coordinates by using Pythagora’s theorem (take the square root of the sum of the squares of the orthogonal distances). All other orthodox chess rules apply. PWC When a capture is made, the captured unit (except a King) is replaced on the square the capturing unit just leaves. A Pawn is immovable on its 1st rank. Super-Circe When captured, a piece is reborn on any free field on the chess board without causing self-check or selfmate. Possible is also removal of captured piece from the board. The Pawns (white, black, neutrals, half- neutrals) can be reborn on the first or eight row also. When reborn on the first row (for Black) or on the eight row (for White) the promotion is obligatory. 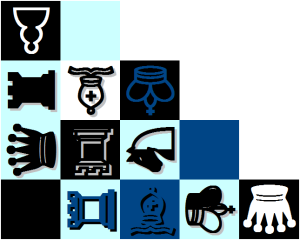 When reborn on the first row (for White) or on the eight row (for Black) the Pawns are immovable. Take & Make Having captured, a unit must immediately, as part of its move, play a non-capturing move in imitation of the captured unit from the capture-square. If no such move is available, the capture is illegal. Promotion by capture occurs only when a pawn arrives on the promotion rank as the result of a take&make move. Checks are as in normal chess: after the notional capture of the checked K, the checking unit does not move away from the King’s square. Transmuted Kings When they are threatened, the Kings move only like the threatening unit(s). It is a great service you do to the chess world. I wish that you add more fairy conditions and pieces in future. You may find more than 180 fairy conditions stated in Popeye out which I presume that many would be aware of only few conditions (I find that I know only about 20 fairy conditions mentioned there). Many composers may not be attempting a fairy condition or may not be using a fairy piece because of lack of knowledge about that condition or that piece. My only request to you is to kindly add as many fairy conditions & pieces as possible in your definitions. Thank you, Bala! I’ve added some more fairy elements and will try to permanently add new. I’ve changed the order into alphabetical. And I will appreciate any comments about correctness of presented definitions, improvements and additions! I have a feeling that Fairy Terms section would be a better place to continue the discussion opened by Peter’s problem No.420. The WFCC Fairy Registration Bureau! The Bureau would contain a Name of a Piece or Condition and its Definition. Does this not put a totally different complexion on the matter? Definition: Kings can only move forwards. The WFCC and magazines may not accept problems with the ForwardKings condition unless C+ with Popeye or WinChloe]. ******** There would be no need to exclude from the Register any definition supplied by either of the two programs. All that would be necessary would to alter a Name given by one of them if the one Name had different Definitions. [Concerning Juraj’s comment: Yes, I was imprecise. It is important only in a Fairy context. Yes, the Register would never be complete – always growing – with ForwardKings!]. [Concerning the absence of Definitions in Popeye’s HELP: the point is for example: it may have taken Thomas [Maeder] hours to program the new Condition FTF and input it into Popeye. It would take him 5 minutes to input the Definition. So the Popeye program should provide for this. I do not know whether HELP is the right or best place to put the definition but it should be put somewhere]. A sophistication in the construct of the Register could be that it could indicate for each Definition which computer program supports the Definition – by initials e.g. P, W, A after a Name. [Or it could indicate which program does NOT support the Definition – perhaps the simpler option] These initials could also be shown in Definitions given for a problem in a magazine. Regarding the practical creation of a WFCC Fairy Registration Bureau: there is of course a common denominator in the management of two particular websites! I wonder whether the WFCC could subcontract a site to do something on its behalf. I’m trying to create at least a better list of fairy terms. For now I have a database with 3 fields for each fairy term: name, definition in English, definition in Russian. Reading Peter’s comment I’ve started to think, that maybe I should add more fields to this db, like: code/name in Popeye, code/name in WinChloe, some additional comments? So, it would be more useful either for the future projects or at least for our current needs. But I’d need your help here, for sure. Also, records of the database can be easily exported/imported into another database. So, the content of my database can be used as a part of any other. A special website is not needed for a purpose of completing the database of fairy terms. It can be just one page like this one, plus with a form allowing to submit a new term. Some temporary database for the new submitted terms, and the main database for approved terms. The font or color used is difficult to read. Is it so only for me? Have changed the font color to black. Is it better? Maybe should add two more sections: stipulations and boards..? The latter can also take care of things like magic squares.. Yes, will do! Will need some help probably with filling in those databases. The new view of section is very good. The function to search by name (name filter) is very useful. Well done! Will be good if you can include it also to original problems (I believe it is possible). For example when you go to Originals 2013 in my website you can write the name of author, or name of the used fairy condition etc. in the “Title filter” and press “enter” you will see the list with all published problems with this condition or author etc. Such filters are very useful for the visitors in my opinion. In Take & Make, what does Type Dupont signify? It means that “delocalized” Pawns are allowed (e.g. a white Pawn on the first row). Such a Pawn may only move one step (capturing or not) and then it becomes a normal Pawn. Thanks for all your work. In Sentinels, can a pawn born on the second rank move 2 squares with its first move? So the answer to your question is “yes”!